Uruguay’s energy transition has made amazing progress. But at the same time, the privatization of power generation and the burden that the country has the highest electricity prices in all of South America are serious problems for Uruguay. The public energy utility company UTE must increase its power share from renewables further, and implement policies that reduce residential electricity prices. The country has done a lot to get to where it is today by investing 3% of its annual GDP in renewable energies. Policy makers have focused on three key policies to drive this trend: auctions, fiscal incentives and net metering. Auctions have been carried out through tenders, assuring bidders that their produced electricity will be consumed for the next 15 to 20 years. The fiscal incentives are mainly tax credits and exemptions of the value-added tax (VAT) on items such as wind turbines and related technologies. And net metering allows consumers to sell excess electricity to the grid and be refunded for it. However, due the high cost of these three incentives, the government has warned that these subsidies will be removed soon. Today, the renewable energy sector in Uruguay already employs more than 11.000 workers. As such, it is in need of investments in a specialized human capital in this new technological development. That is why, during the month of October 2018 in the small city of Durazno, the Center for Training in Operation and Maintenance in Renewable Energies (CEFOMER) was founded, which is the first of its kind in the country. The center’s goal is to train people in all types of companies in the wind, solar, photovoltaic, solar thermal and biomass sectors. It was made possible thanks to joint cooperation between the National Institute of Employment and Vocational Training (Inefop), the Ministry of Industry, Energy and Mining, the Technological University of Uruguay (UTEC), the Chamber of Industries of Uruguay and the Intersindical Workers’ Plenary (PIT-CNT). 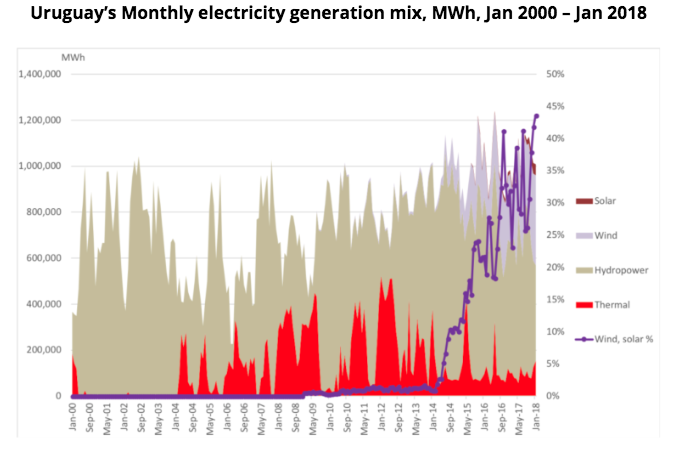 Perhaps the biggest criticism that trade unions and NGOs have of Uruguay’s energy transition is that it has largely led to privatization of the electricity sector. Before this privatization, the public company National Administration of Power Plants and Transmissions (UTE), generated, transmitted, distributed and commercialized 100% of the electricity in the country. Today, AUTE, the union workers of the company UTE, claim that more than 50 percent of electricity generation is in the hands of private companies. Gabriel Soto, the President of AUTE, has stated that: “The change in sources was made through a strong process of privatization, which generates an inefficient use of these energy when combining them with others. They freed companies from 100 percent of taxes.” Soto also added “There are investments of 3.5 billion dollars that did not leave any money to the state. The companies were offered a 20-year contract through which the UTE is committed to buy all the energy they generate and pay them in dollars at a fixed price”. In addition, the high price of electricity (especially that in the residential sector) must be addressed by Uruguayan energy reform. Uruguay is the country with the most expensive electric power in all of South America, before Chile, Brazil and Argentina. Gabriel Soto claimed that a family of four spends about four percent of their income on electricity, while poor households pay up to ten percent. Even though residential electricity prices are now almost 20 percent lower than in 2010, the energy transition has not changed Uruguay’s position in this regard. Over-generation seems to be a big part of the problem when private companies are secured buyers for the next 15 to 20 years as stated above. It is undeniable that Uruguay through a decisive public policy has facilitated its massive growth of renewable energies, which has meant the transition in five years from a polluting and non-renewable matrix to a mostly clean and renewable electricity sector. However, there are two challenges that the Uruguayan energy sector must face to make it fit for the future. The first is to build up enough human capital to face these new challenges, the second is to reduce the residential electricity tariff to make the consumers benefit from the energy transition.